What author Roy Lessin refers to as "spanking" throughout his book would be more accurately characterized as "whipping" or "flogging." He advocates a flexible switch and whaling away until the child's "cry of anger" turns into a "cry of repentence." But this "cry of repentence" has nothing to do with actual repentence. It is the cry of anguish of a creature broken by torture. Any child thus treated would emit a "cry of repentence" after enough lashes had fallen, even if the child actually wasn't guilty of anything. This is not about "repentence," it is about torture. One of Lessin's many dubious assertions is that children "spanked" with a flexible rod will not fear their parents, only the rod itself. In short: "parents don't spank children - rods spank children!." (Presumably Mr. Lessin is not a member of the NRA). Such brazen denial permeates this book, manifesting also in the cloyingly cute pencil illustrations which clash so markedly with the book's actual content and message. 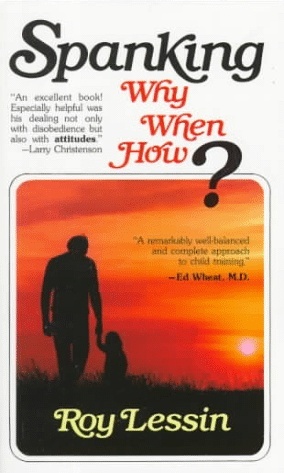 Lessin's book constitutes a how-to manual for those who wish to practice what author Susan Forward calls "Toxic Parenting." Throughout the book, the author urges parents to use "spankings" to force children to exhibit outward emotions pleasing to the parent. On page 51, Lessin recommends "spanking" a child who goes to bed immediately when told, simply for having a pout on their face. He also recommends that a child who cleans their room when told, but with a "long face" should be "spanked" as well. On page 52, he writes "Even a small child can be told, 'Please change your attitude. Be happy,' and be trained to do so.'" This forcible suppression of the child's real emotions, while training her to exhibit fake emotions more to the parent's liking, is profoundly harmful to the child's emotional development. It is not "for the child's own good." Rather it serves the interests of the parent only. One way a child may cope with parental cruelty is by eroticizing it. Such children possibly include the author's own son. On p. 76, Lessin relates an anecdote in which his wife had given their son a quick spanking. "When she finished he turned to her and said, 'Mommy, could you spank me again? only this time let me pull down my jeans. It didn't hurt enough.'" Lessin claims this proves merely that "children need effective discipline," but this is not the only possible explanation. Those who are turned on by talk about whipping children on the buttocks with rods will probably enjoy this book. Those who are serious about raising healthy, happy, automonous children would do better to read "Parent Effectiveness Training" by Thomas Gordon and "How To Talk So Kids Will Listen And Listen So Kids Will Talk" by Adele Faber and Elaine Mazlish. As a parenting manual this book is worse than useless, and belongs in the dustbin.